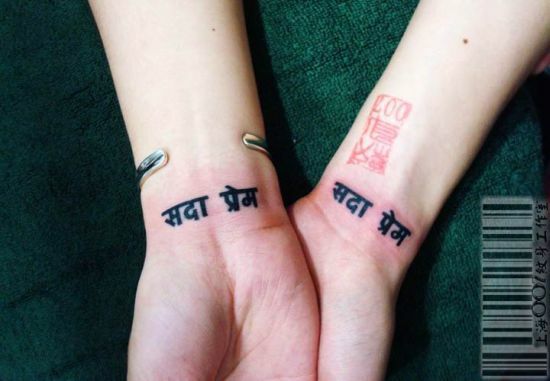 Home Off Beat	Couple Tattoo-Hindi version of ‘Undying love’! Couple tattoos are not new and in the past couple of days weâve seen many similar tattoos adorned by lovers. Hereâs yet another couple tattoo but a tat which deserves to be mentioned. The tat is in Hindi and reads âSada Premâ which in English means âUndying loveâ. These lovers could have got it inked in English but they chose to get the similar tat in Hindi. Not something we come across everyday! ← Lilly Allen’s finger tat reads Shhh…..